It's a new Point n' Click Adventure! Which plays like all the old ones. I'm beginning to think the 'Point n' Click Adventure' genre is not for me. 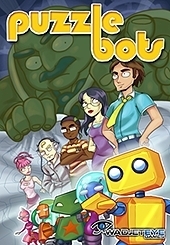 Scratch that - I'm positive the genre is not for me after playing Puzzle Bots. I mean, it's got to be true; here's a game that will almost certainly give fans of the genre what they want: witty writing and plot twists intertwined with puzzles that come in the form of manipulating environments or people to do as the player desires. This is how they've always been since the genre was formed, and perhaps it will never deviate apart from a few statistical outliers. And yet, playing Puzzle Bots made me wonder if this is okay. I'm a big fan of the JRPG, but I always decry their insistence on remaining static in an industry that keeps moving forward. Point n' Click Adventure games are perhaps tied for 1st place with the JRPG for 'genres that desperately need to learn some new tricks,' and Puzzle Bots doesn't do much to make me think that someone out there agrees with me. We start with a commercial from Dr. Hugo's Factory For Making Robots. He's intent on rolling out a new line of robots which do nothing but chores. Hooray. After learning this, you start a tutorial, where you learn how to make your bots - the protagonists of the game - do stuff. You start with the first bot, Hero, who can pick stuff up and use it on things. Of course, you eventually get more robot helpers, like Ultrabot, who can push things, or Kelvin, who can ignite things. For no particular reason, these robots were made to be sentient. So, when they are put in the 'robot habitat,' they (i.e. Hero) decide it would be fun to escape the habitat and explore the surroundings from time to time. Whoever wrote this story must have watched a lot of Rugrats. I mean, think about the parallels - we have Hero and Ultrabot, who seem to directly mimic the Rugrats's Tommy and Chuckie; one is bold in the face of all adversity, while the other one is scared, cautious, and sensible. When either Hero or Tommy get curious, they know how to use the tools within their contained environment to escape and check out what's going on. Of course, the inventors (or the parents, in the case of the Rugrats) find the escapees, place them back where they belong, and never try to figure out how they escaped. After all, there wouldn't be much to either Puzzle Bots OR Rugrats if they couldn't go exploring, right? Another big parallel is how they both view their environments with childlike awe and innocence. Sparing any examples from Rugrats, the Puzzle Bots have a wild imagination as well. At one point early in the game, they attempt to fly from one side of a kitchen counter to the other in a 'rocket ship' (which is just a coffee maker). Although at other points in the game, they can differentiate a toy house from a real house and can recognize something as antiquated as a VCR. Maybe their charming naivete programs are malfunctioning, or something. Even the art style is pretty cartoonish; with the exception of the robots, which look decidedly video game-esque, all the human characters and backgrounds look like something you'd see on an animated TV show. The look is really nice, although the animations are a bit clunky at times for the human characters. At the very least, the robots themselves look and animate well. The music is not particularly standout or catchy, but it does fit the setting and tone of the game. In any case, the humour is there; seeing the bots interact with their surroundings, as well as seeing the scientists interact with each other, is definitely the most entertaining part of Puzzle Bots. The dialogue is top notch; the entire first half of the game was non-stop laughter for me. The second half of the game marks a bit of a halt in the funny interactions, and focuses on the gameplay. This is where Puzzle Bots began to bore me in the narrative department (not to mention the sudden plot reveal at the very end, where the players learn virtually every single thing about the plot. This has never been effective in the past, so why keep trying this move?). Can you set it on fire? Can you do something with it underwater? Can you blow it up? With the exception of the very last puzzle in the game (which was mostly hard due to there being a few dead-end leads... not cool, guys), the game is a total breeze, and every solution is either painfully obvious or easy to solve with the five step checklist seen above. Much like with the tiresome JRPG, I have to wonder how people can keep playing the same game over and over again. Even within the realm of Point n' Clicks, Puzzle Bots doesn't really have a lot to offer comparatively. Big (and I mean, BIG) fans of the genre will probably ignore these faults, as one can count on them to be in just about every similar game. Otherwise, Puzzle Bots is an extremely short game that does nothing to break the mold, and can't even remain interesting for its entire length (maybe 3-4 hours tops). I've learned my lesson, though, and I promise to stay away from critiquing any Point 'n' Click game that isn't from the Ace Attorney series from now on.